In 2011, Reece's Rainbow graciously provided thousands of dollars for our adoption of Teague, Trenton, and Maclayne. The adoption grant was made possible by PRECIOUS generous donors who saw the potential in our children. This time around, RR will be providing thousands of dollars from NUMEROUS precious donors in order for us to bring Greta, Felix, and Romeo home. Because of these lifesaving gifts, SIX orphans have a forever home and know the love of a family. Teague, Trenton, and Mackie are flourishing in our love and we cannot wait to watch as Greta, Felix, and Romeo flourish! 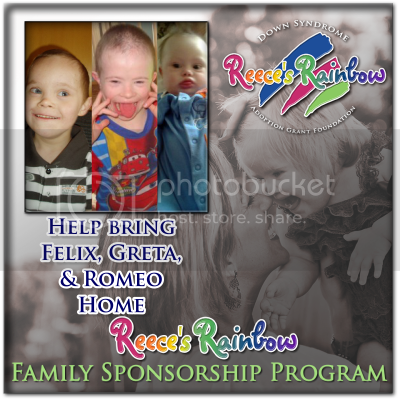 Reece's Rainbow is a 501(c)3 Adoption Grant Ministry that provides money to families who are adopting orphans with Down syndrome and other special needs internationally. 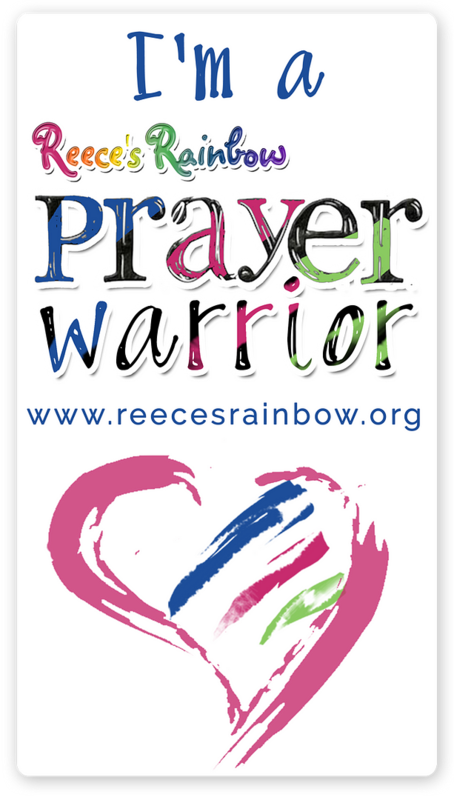 (To read more about RR, please click on this link: Why Reece's Rainbow?) RR relies on the generous donations of people like YOU! 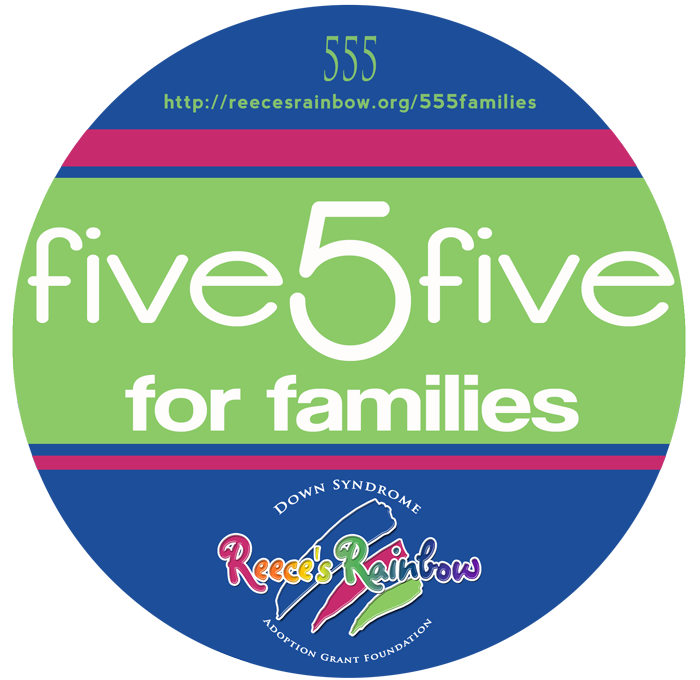 Their new campaign, five5five for families, kicked off a few months ago and directly benefits five different families each month who are in the process of adopting an orphan (or orphans) with special needs. From the RR website: "After 8 years, $7 million in grant funding disbursed, and more than 1500 orphans have found forever families, you KNOW how far your giving goes collectively through Reece’s Rainbow! Set up an auto-bill-pay donation from your bank, or through the PayPal link, to give just $5 a month for our adopting families!" I just set up David's and my $10 recurring monthly donation to benefit these families and their CHOSEN children. Although this is not a huge amount, it can be MULTIPLIED if more people will join us. If you aren't able to do it each month, a one-time donation will also be greatly appreciated!! Your amount does not have to be $10 ~ it can be more or it can be less. Please give what you can. I promise you, God will USE YOUR GIFT!! WILL YOU PLEASE JOIN US????? So, on behalf of Reece's Rainbow: "Thank you for your donation to the children of Reece’s Rainbow. Your gift is truly the gift of LIFE, HOPE, and a FAMILY for an orphaned child with Down syndrome [and/or other special needs]. Your support for this organization throughout the year is greatly appreciated. Should you have any questions, or need to provide us with any additional details about your donation, please do not hesitate to write [or email]. Be sure to browse our website, and discover all the amazing ways you can be a Voice of Hope for our waiting orphans!"